The LEAPS project is committed to large-scale renewable energy storage. Combining time-tested technology and the distinctive geography of Lake Elsinore, LEAPS provides clean, reliable power, when we need it most. Nevada Hydro’s flagship project, the Lake Elsinore Advanced Pump Storage (LEAPS) project, was designed to respond to the growing need for reliable renewable electricity and to help meet California’s ambitious emissions reductions programs. It is the most promising large-scale energy storage and load balancing technology for the Southern California electricity grid. Nevada Hydro was founded in 1997 and is headquartered in Vista, California. 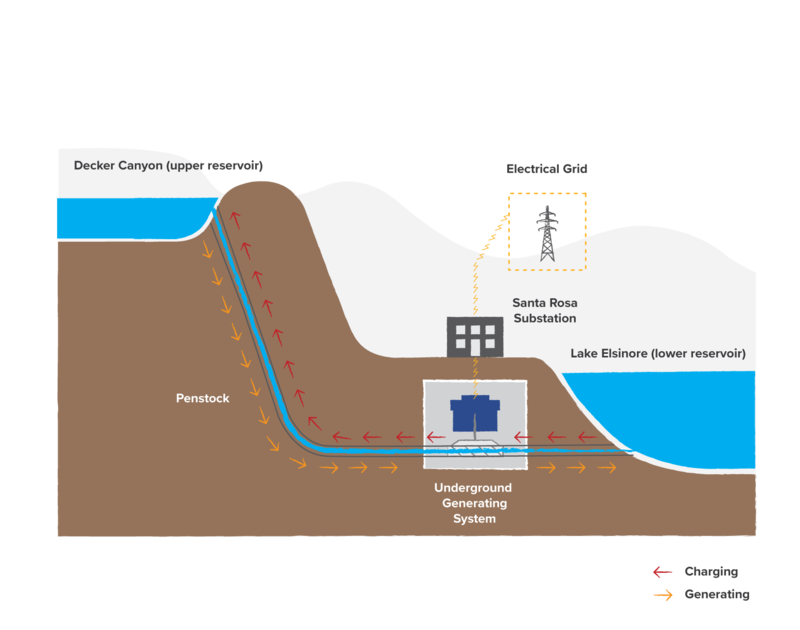 The Lake Elsinore Advanced Pumped Storage project is an energy generation and storage project. It is designed to help stabilize electric infrastructure and maximize the use of all forms of renewable energy. With generating capacity up to 500 MW, this storage can provide vital “load balancing” to California’s electricity system grid by dispatching energy quickly during peak usage and storing unused energy at low-demand times. This load balancing helps prevent power outages. It will also help ensure maximum use of renewable energy resources that would otherwise have to be curtailed in low demand conditions. California has set renewable energy targets of 50% of total generation capacity by 2030. As a result, renewable, GHG emissions-free generation and storage capacity is needed more than ever to optimize the contribution of renewable sources such as solar and wind energy. LEAPS is designed to help answer this challenge. Nevada Hydro filed its Final License Application (FLA) with the Federal Energy Regulatory Commission (FERC) on October 2, 2017. Nevada Hydro is executing a rigorous meeting and review schedule with all relevant agencies in accordance with the terms of the FERC hydro licensing process. In addition, Nevada Hydro is undertaking additional stakeholder communications via its website, project materials, meetings, email bulletins and will be scheduling an open house for residents in the Temescal Valley. LEAPS leverages the unique combination of an existing water body, sufficient topographic variation, and proximity to southern California energy markets to construct and operate the most advanced, large-scale pumped hydro storage project in the USA to meet California’s growing need for renewable electricity sources. The pumped storage facility serves the power needs of the Southern California regional metropolitan areas. It augments the local economy in the Temescal Valley through: i) significant construction jobs; ii) indirect employment in the hospitality and service sector; iii) payment of municipal and state taxes and fees; and iv) contributions. Pumped storage hydroelectric facilities store energy in the form of water in an upper reservoir, pumped from a reservoir at a lower elevation. During periods of high electricity demand, power is generated by releasing the stored water through turbines in the same manner as a conventional hydropower station. During periods of low demand, the upper reservoir is recharged using low-cost electricity from the grid to pump the water back to the upper reservoir. Invented in the 1920’s, pumped storage technology remains the most efficient large-scale form of renewable energy storage, boasting round trip efficiency of up to 87 percent and a lifespan up to 100 years. Further, pumped storage facilities improve electricity supply reliability without the environmental impacts of coal, oil and gas, or nuclear fueled electricity generation. This efficient, clean energy source allows “on-demand” power generation when consumer demand spikes, or when renewable sources such as solar and wind energy are not available (such as cloudy, windless days or at night). Pumped storage requires a significant difference in elevation between the source lake and the upper reservoir for maximum efficiency. This means viable sites for pumped storage are rare. The proposed Lake Elsinore site has been identified for many years as uniquely suited for pump storage and will enable optimized renewable energy generation in California, in accordance with the State’s renewable and environmental objectives.